Redwood Park is one of the largest parks within the Toowoomba City Boundary. Situated on the eastern side of the range escarpment between Prince Henry Drive on the north, the Warrego HIghway on the South, and the boundary with Lockyer Regional Council on the east, the park occupies an area of 197 hectares. Within this park there is a large area of endangered dry rainforest clothing the southern slopes below Prince Henry Drive. The endangered black breasted button quail used to inhabit this forest but unfortunately, it has not been seen here for many years. Further in the rainforest the endangered orchid Sarcochilus weithallii can also be found. Most of the forest has been invaded by serious environmental weeds, either garden escapees or exotic pasture grasses. In the open eucalypt forest, lantana is the significant understorey and in places, monocultures of privet can be found. Most of the native grasses have been replaced by the exotic grasses green panic and rhodes grass, probably introduced by previous farmuing activities. In the dry rainforest, cats claw creeper and madeira vine cover much of the ground and the forest canopy. Stands of coral berry are wide spread in the forest, preventing regeneration of native ground covers, grasses and shrubs. Lantana is also found in stands in the rainforest, but only small amounts of privet are found. In some areas climbing asparagus, which is found in most of the rainforest, is a major problem, replacing cats claw and madeira vine as the main canopy killer. In the early 1990s, the Friends of the Escarpment Parks under the leadedrship of Dr John Swarbrick tackled the cats claw creeper in an area of the dry rainforest closer to Bridge Street. Because of the large expanse of the exotic creeper, many of the volunteers became overwheled. The group decided to focus their activities on smaller parks. In the mid 2000s, after contractors had sprayed a section of the forest on either side of Redwood Forest trail, the Birdwing Butterfly recovery program was commecned in the lower section of the park with the planting of about 50 birdwing vines. About 50% of these vines have survived. A follow up spraying by contractors a couple of years later again targeted the exoitic weeds, but without followup the general feeling that the program was unsuccessful. No further work was done by FEP until 2010 when FEP coordinated a group of 50 students from Concordia College to remove a large amount of coral berry from the section of the forest immediately across Gatton Creek from the picnic area. The weeds were bagged and removed by the Toowoomba Regional Council. This had a significant effect on the area of the forest. In July 2011, FEP began a more permanent presence in Redwood Park. 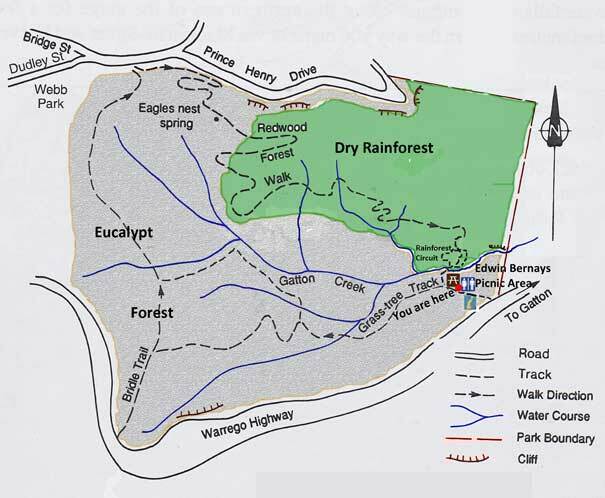 Initially FEP selected a amall area across Gatton Creek from the picnic ground. Using manual methods most of the weeds in this area have been brought under control, although regular followup work is undertaken to remove weeds that have regenerated from the seed bank. Most of the cats claw creeper and madeira vine that was in the canopy in this area have been killed. Follow up work on the regrowth will have to be maintained for several years until the seedbank and all tubers have been eradicated.